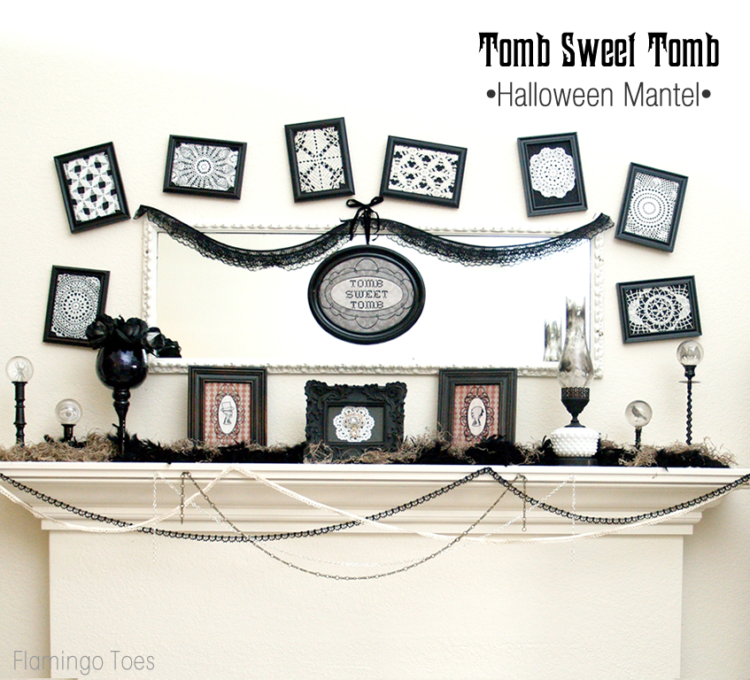 On Monday I shared my Tomb Sweet Tomb Mantel, which is all designed around some fun Vintage Halloween Embroidery Printables! 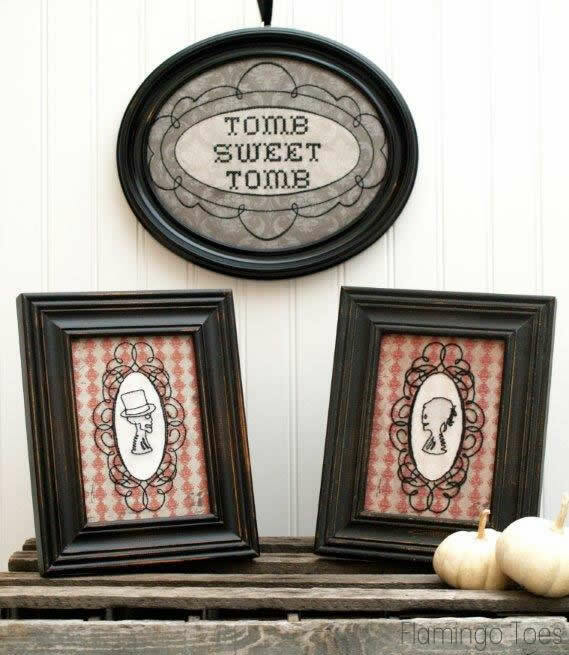 This Tomb Sweet Tomb stitchery and the Cameo Couple are so fun and I love the spooky style they give the mantel! 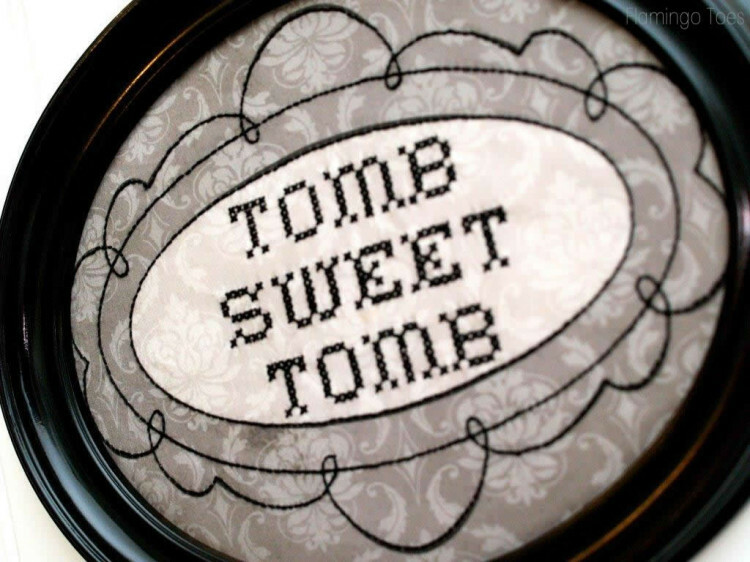 I have been in love with the Tomb Sweet Tomb stitchery that lives in the hallway of the Haunted Mansion ride at Disneyland. It’s so fabulous and scary. 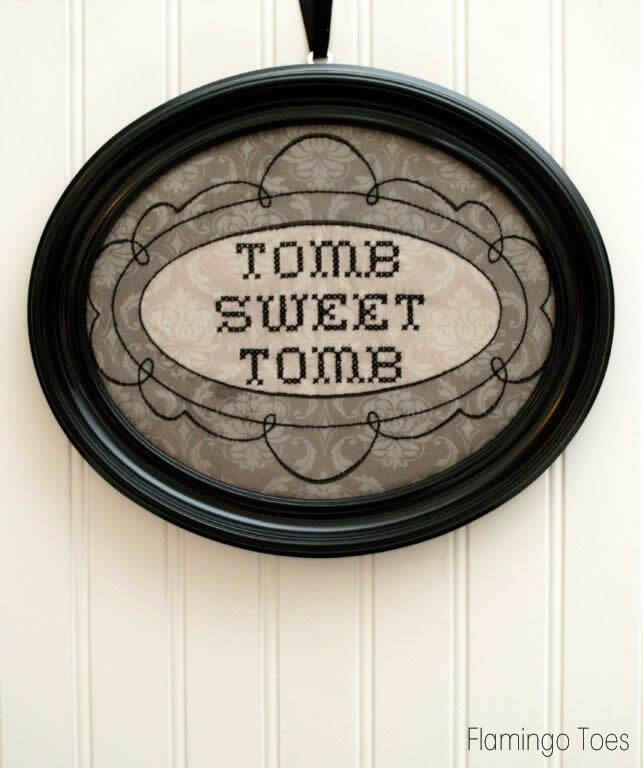 Mine is a little simpler version – since I didn’t want to cross stitch an entire sampler just for Halloween. Call me a slacker. It is a simple piece to stitch! I’ve designed a pattern for you that is printed on fabric with your inkjet printer. The damask pattern and stitching lines are printed right onto the fabric. I used cross stitch for the letters, and back stitch for all the swoops and outlines. My frame is an 8 x 10 oval but it would fit in any 8 x 10 frame. The damask and lines are all printed onto the fabric, so it is very easy to do! No tracing and counting stitches. In fact, the graphic would be a great printable too! You could just download the pattern, print it, and pop it in a frame! Boom. Easy Halloween decoration. 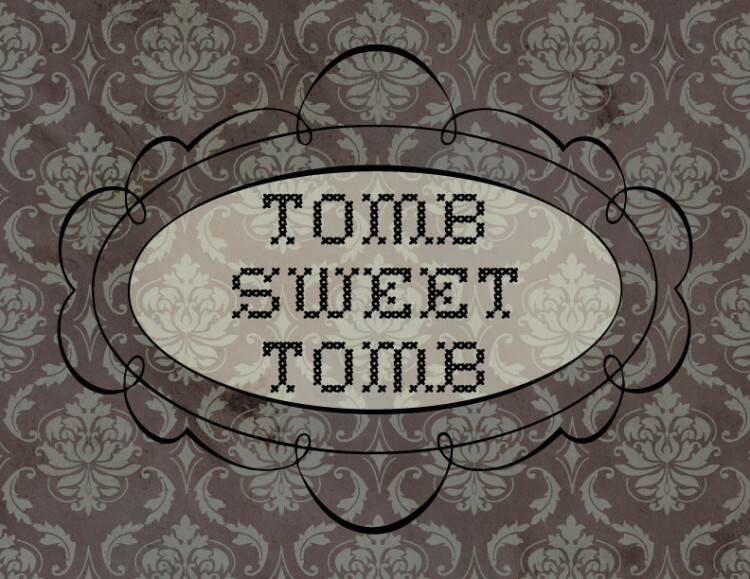 Here is the PDF for the Tomb Sweet Tomb design. Our Cameo Couple are designed the same way. They are sized at 5″ x 7″ and fabric printed designs as well. Mrs. Cameo is a past Halloween Project. You can click here for her pattern, as well as instructions on how to print on fabric. 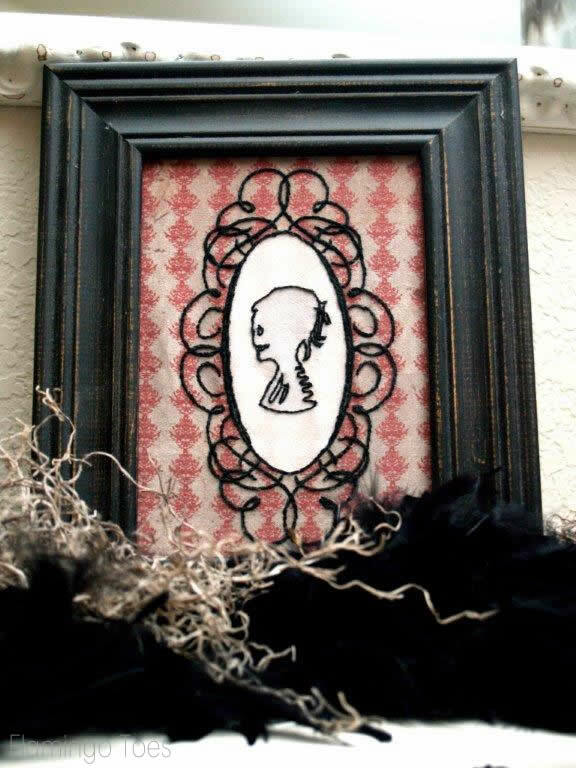 Mrs. Cameo Instructions and Pattern. This year I wanted to create a Mr. Cameo – she really needed a friend. 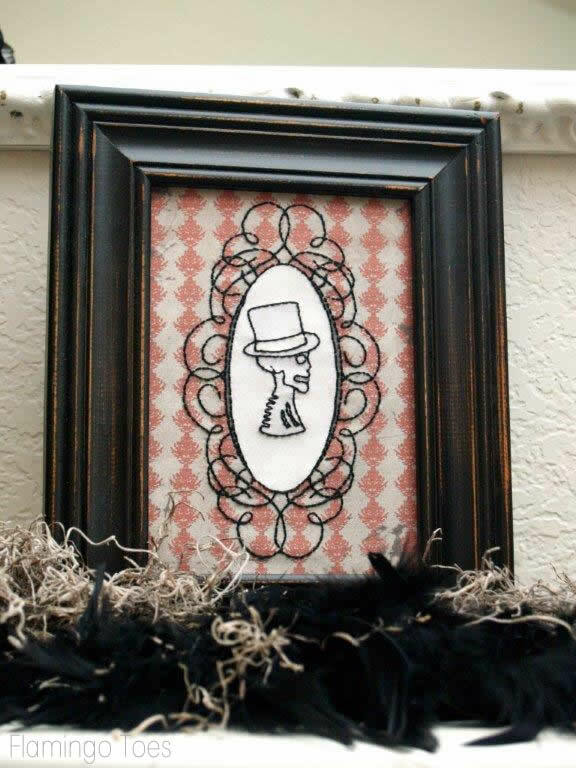 I flipped the image and designed a dapper gentleman skeleton for her. He is embroidered entirely with a back stitch. Easy and quick! Oh so handsome. Sort of. These images can also be used as printables – they are all ready to go! I hope you like them! Here’s a view of the mantel with them all decked out for Halloween. Linking up at Met Monday, Tutorials & Tips Tuesday, Shabby Creek Cottage, 504 Main, The 36th Avenue Party, Block Party, and the other fabulous parties on the party page. Make sure you check them out! Your mantel is adorable. i love how you hung all the pics. off kilter. What a fun prinable! I love this whole project. How fun! You’re so creative and generous, Bev!! 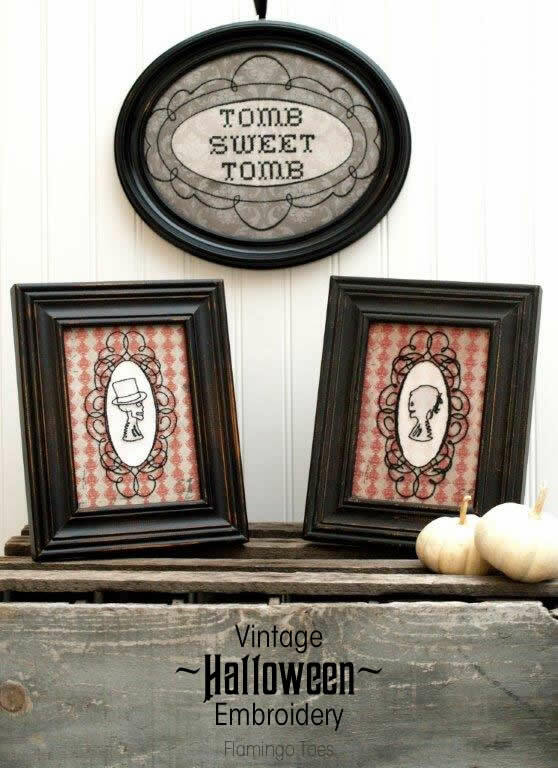 I just love the Tomb Sweet Tomb. Awesome! These are amazing! You are so, so talented. 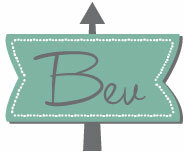 Bev – Love this so much! The Haunted House is my FAVORITE ride at Disneyland and I never get to go on it because my kids hate it…and I love that this reminds me of it. Oh my gosh! I HAVE to make these! These are wonderful. I think I’m going to feature them on the next episode of my DoomBuggies Spook Show podcast. Thanks for sharing such fun designs! If you felt like it, I would love to have you come link up at the Free and Fun Friday blog party I host each weekend… it just went live! These are great–pretty and creepy!